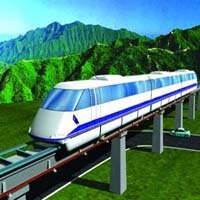 Magnetic levitation trains also called as Maglev trains are becoming a popular transportation all around the world. Maglev train came to commercial use on December, 2003. These trains runs on electromagnetic suspension (EMS) concept . The magnetic field generated by the electrified coils in the runway makes the train moves. And the major thing is these trains do not have engine . There are presently very few commercial maglev transport systems in operation. Some countries use powerful electromagnets to make high speed trains. Recently China successfully tested a locally made magnetic levitation train.